Established in 1830, Eschmann’s expertise and superior quality equipment is trusted by medical professionals the world over. Eschmann work closely with industry professionals at the leading edge, to design and produce market leading products and service support around the world. Eschmann design and manufacture a range of market leading products and supply medical products and devices to hospitals, GP surgeries, and dental practices in both the private sector and public sectors. Our products have been supplied to medical institutions across the globe, either direct or through our network of trusted distributors for well over 100 years. As part of an ongoing investment plan to improve the efficiency of the manufacturing process and provide a superb working environment for its employees Eschmann Holdings wanted to install a tough and low maintenance floor that was colour coded and that could be moved around if necessary. The existing substrate was asphalt so the preparation required to make this suitable for a traditional floor covering such as epoxy or vinyl would have been extremely costly, time consuming and disruptive. Ecotile was dry laid without the need for screed, adhesives or any other treatment of the substrate. 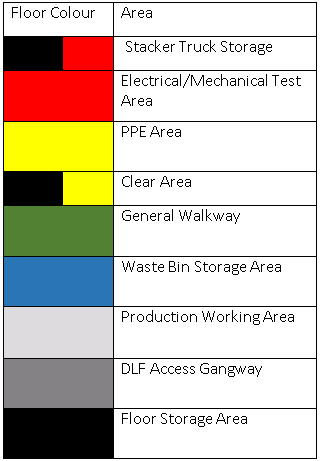 It was important to colour code each stage of the production process to maximise efficiency and also to mark out storage areas for specific items to ensure they were always returned to the same place each time. Due to the nature of the products Eschmann manufacture a large area of the floor needed to be anti-static but not to require maintenance of its anti-static properties. Eschmann wanted to install the tiles themselves to fit in with their busy production schedule. “Our interlocking floor tiles are frequently chosen for flooring projects where the substrate is problematic. The interlocking tile system means Ecotile can be dry laid over any hard surface including oily, damp, uneven or contaminated floors quickly and easily – in that case Eschmann were able to do it themselves without any downtime or disruption to their production schedule. The 500mm x 500mm tiles are ideal for demarcating zones – even very small or oddly shaped areas and they can be laid in a chequered pattern to warn of a hazard such as forklift or pallet truck movements as Eschmann have done here.